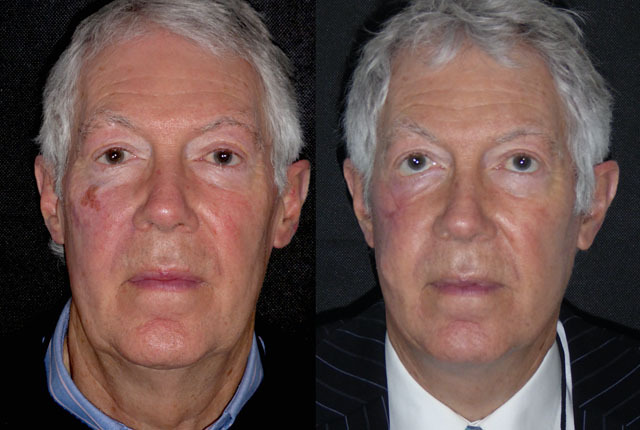 Terry was referred to me by colleagues at the London Oncology Centre on Harley Street. 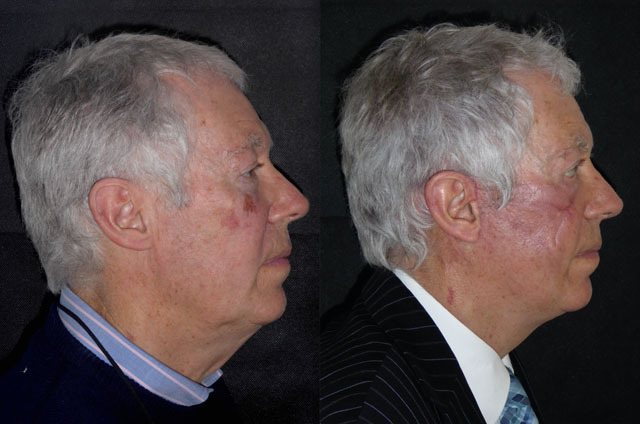 He had a large melanoma of his right cheek with a second suspicious lesion next to it. It needed to be removed but was in a very conspicuous place. 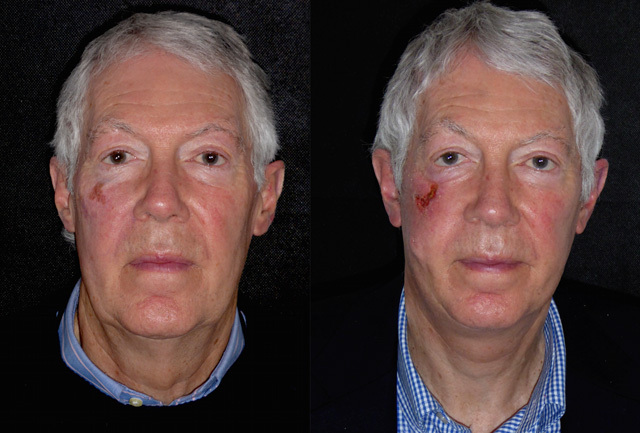 Terry was on the NHS waiting list for this but was being offered a procedure that would have filled the defect with skin taken from elsewhere on his body which would not have left the ideal aesthetic result and resulted in a patchwork face. 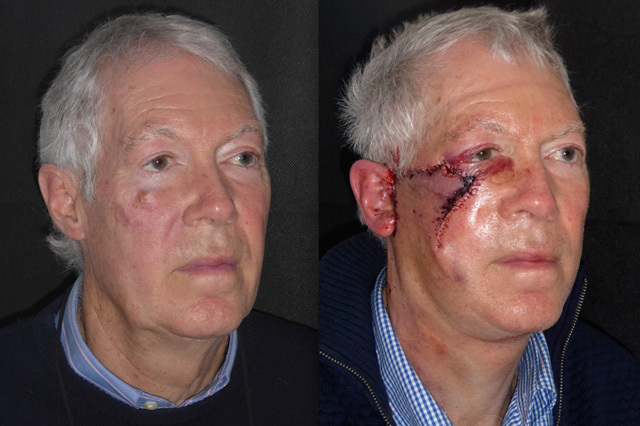 To enable me to advance his normal skin over the hole where the cancer was removed I decided to perform a facelift to create enough tissue excess to fill the defect. This, again, was all performed under local anaesthetic. Terry talked to me throughout. That was a big hole! In cancer surgery you don’t just remove the actual cancer but an island of normal tissue around it. I had to perform a really quite extensive dissection to free up enough skin to advance his cheek forward. The aim is to get the defect site closed but also to place the donor skin in position with as little tension as possible. There was some tension at the edge of the flap but it had a good blood supply after closure so should be fine. 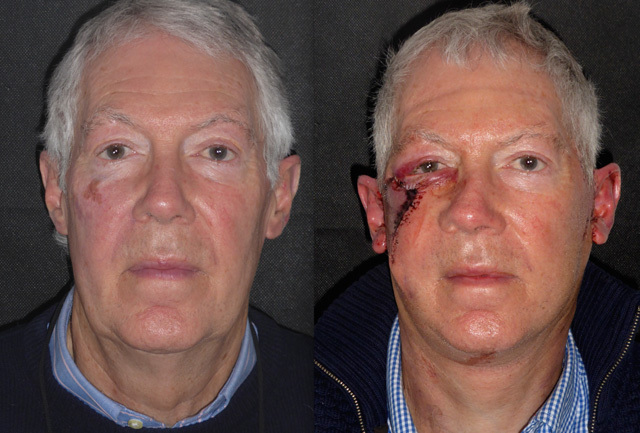 Despite this extensive facial reconstructive surgery, Terry looks great. He is swollen as expected but there is much less bruising than I expected. 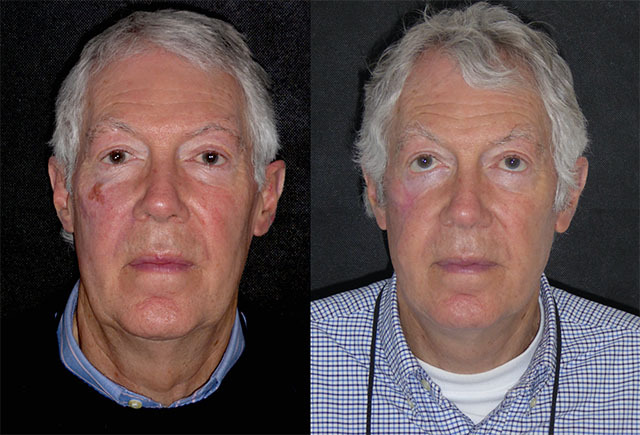 His nose and right lower eyelid are pulled with the tension and swelling but these will correct nicely in a few days. Terry is back for a check on his flap and removal of stitches. He is looking great. The cancer has been looked at by the pathologists and is completely removed with good margins. The edge of his flap is a bit dark but the underlying skin is alive as hair continues to grow through it. I am using a vasodilatory paste to help it along. It will scab and fall off over the next few weeks to reveal healing skin below. 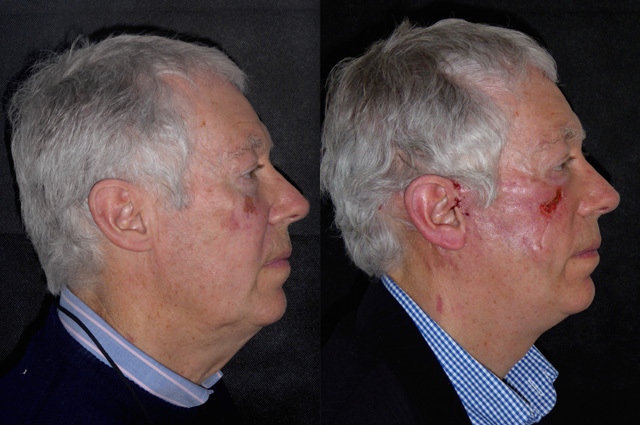 His swelling has settled and despite being a secondary effect, Terry is looking much younger with redefinition of his jaw and neck lines. One pesky bruise in the right jowl is the extent of his bruising! 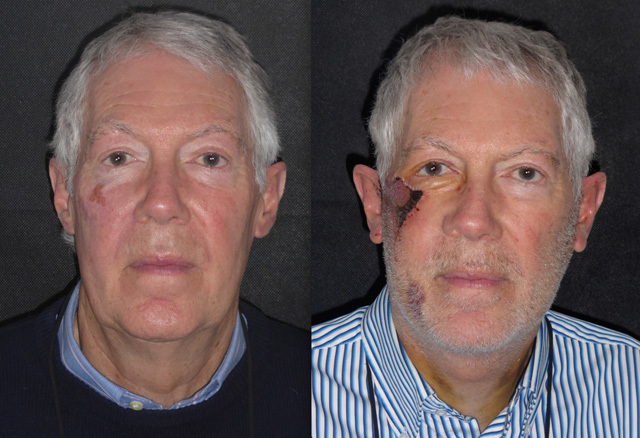 Here is Terry 4 weeks after excision of his facial melanoma, facelift and cheek advancement flap. 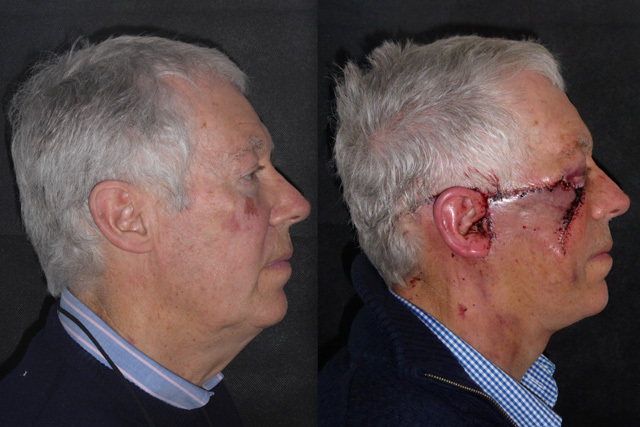 This was quite extensive surgery but only four weeks on he is healing really well. 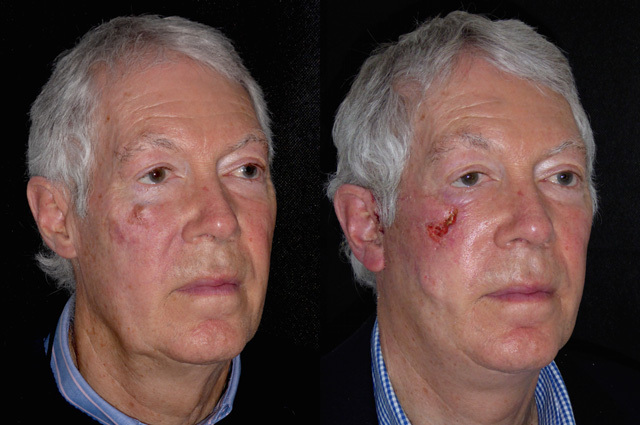 I have just removed his scab to reveal healthy skin underneath that will heal in a week or two. The skin flap is healing underneath and he has some lumps and bumps which will all settle with a little more time. 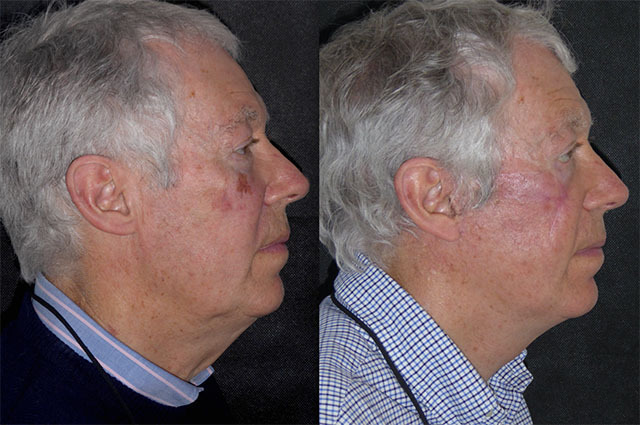 His scars from the facelift and cheek advancement flap periphery are healing beautifully and I suspect by his 3 month review will be all but gone. 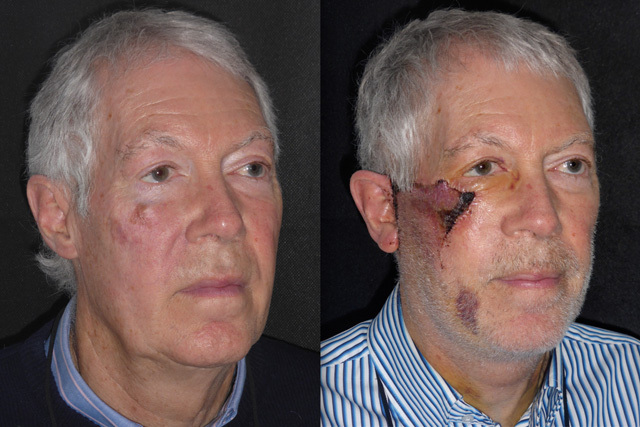 Here is Terry 12 weeks after his facial skin cancer removal and reconstruction. He is healing well, although the edge of the skin flap is contracting as expected for this stage. 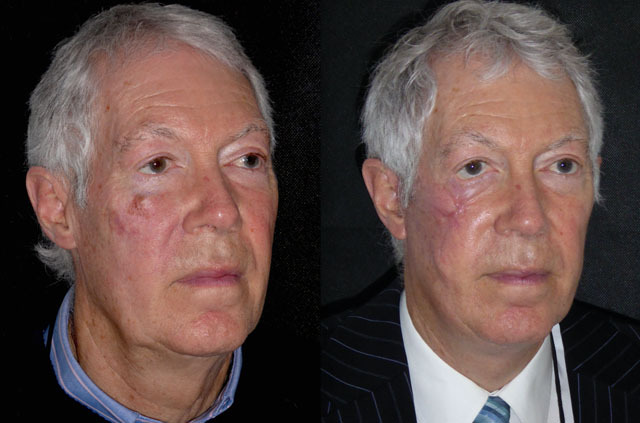 As the scar softens, the tethering should release the slight downward pull of his right lower eyelid. There are a few procedures that I can do to rectify this if it doesn’t resolve by itself, I will help it along. 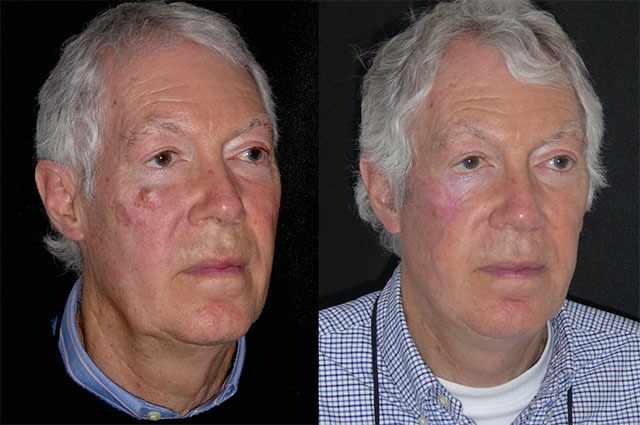 Aside from this, Terry looks great, rejuvenation is a welcome side effect of his skin cancer surgery. 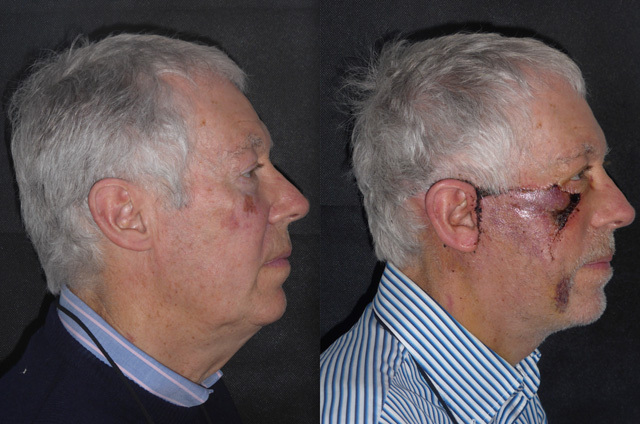 At a year out Terry is now nicely healed and there is no sign of recurrence of his facial melanoma. The contracture in his scar is softening and I plan to tighten his lower lid in due course when the scar is fully mature. Functionally the eye is fine and the lower lid pull is improving as his scar softens so we are watching and waiting. Terry also has a small fatty lump at the pivot point of his facial flap which I will also remove for him.